Sometimes the hands rise slowly. Sometimes they shoot up quickly. Other times, hands rise up cautiously as the eyes dart around the room. I love this moment for its honesty, its quiet potential, and the way that question maps out the terrain I have to travel to at the least show each and every school in Howard County that poetry is present, possible and matters. As writer-in-residence for HoCoPoLitSo, I travel to the county high schools to read and talk poetry. During the reading, I share stories behind the inspiration and origin of some of the poems and then I ask the students if they have any questions about certain poems. Many even request me to read certain poems and then give their own interpretations on them. We talk about other things as well. Ipod playlists. If Twitter is an appropriate space for poetry. Role-playing games. Favorite books. Dating. Haiku. Race. Gender. The list goes on. If I have any sort of a complaint, I wish that perhaps my visits could extend past the usual fifty-minute class time. Usually the bell rings and the students make their way to lunch or to another class and I find myself a little melancholy that the connection we’ve built in just a short time is broken. But so much has happened within those small bubbles of time. I’ve witnessed brave students share their own poems when I’ve asked if there are any other poets in the room. I’ve watched them deliver heartbreakingly honest and earnest poems, shaking paper and all, with the kind of sophistication and insight I truly wished I possessed at their age. I’ve stayed after my allotted time with passionate teachers and their poetry-hungry students who fire questions like pistons at me about form, meter, and content. I enjoy this job most of all because I realize that Howard County is not as mysterious as I thought, because poetry dwells there, and anywhere poetry lives is home. To support HoCoPoLitSo’s Writer-In-Residence program in Howard County high schools, consider making a donation. Students and a Writer Ask: Am I Really Here for Poetry? When I got the news that I was tapped to be the 2012-2013 HoCoPoLitSo writer-in-residence for Howard County back in early August, I was as nervous as I was excited. The nervousness I mention first because with my own schedule that ebbs and flows with the responsibilities of being a working poet and teacher, I wondered if I could fit these visits in, and more importantly, if I could find my way around in the mysterious Howard County. Honestly, Howard county was only familiar to me for two reasons: the city Columbia and the absolutely awesome vegan restaurant not too far from Columbia called Great Sage. But beyond the nervousness, my excitement was also sparked by the mystery of the unknown. As my imagination began its snowball’s journey down the hill of infinite possibilities, all sorts of questions were percolating around in my brain . . .
What are Howard County high schools like? What will they think of my poems? Will they relate to my poems? How should I present my poems? Should I talk and then read, or read and just talk? I carried all of these questions with me on my first school visit to Oakland Mills High School and I was pleasantly surprised and relieved to find that my first reading would be in the school’s media center. As I scanned the faces of those students that first day as they filed into the library, quietly chatting to each other while stealing looks at me, I was strangely calmed by the spectrum of expressions I saw. There was curiosity, vague interest, teen-aged skepticism, and of course, the glazed over “Am I really here for poetry?” look. What I realized, after taking in the expressions I saw, was that I had worn each and every look displayed in front of me. I was reminded that I was a high school student once, a student who was immediately skeptical, inquisitive and up-in-arms whenever we were told we had a special guest speaker. 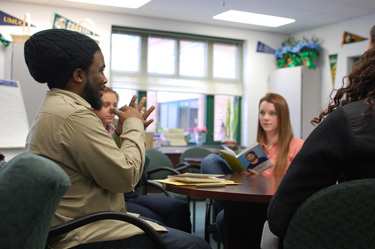 Guest bloggers Joyce Braga and Sam Rubin share their experiences of this year’s Writer-in-Residence in the Howard County Public School System, Derrick Weston Brown. As the high school liaison for HoCoPoLitSo’s writer-in-residence, I’ve guided many poets around Howard County high schools. After I e-mailed Derrick Weston Brown, this year’s writer-in-residence. I prepared myself for our first meeting, scheduled for Nov. 12 at Oakland Mills High School, by reading his biography and his on-line interviews. I expected the usual poet—a little bit of a performer, a lot of ego and touch of swagger. I looked at the picture of Derrick Weston Brown, and knew I was right. But I was wrong, and in a good way. I met Derrick at the school front desk. I rattled off instructions: Here’s the packet, here are your poems, sign the book, here’s the room. Oh, and please tell me how you want me to introduce you. Derrick seemed surprised, almost shy about telling me his accomplishments. When Derrick began rather softly to read, I soon discovered why. He’s a very introspective individual. He thinks very deeply about life. He lets the students know “life’s a journey” and not always an easy one. He’s been writing since he was a child. Even with a masters’ degree in writing, getting published was a struggle for him. As Derrick spoke, the students were fascinated, and so was I. He told the students he likes to eavesdrop on people, and I too felt a little voyeuristic in the classroom, listening to his stories. Rather than giving students his biography, Derrick uses poetry to tell his audience about himself. As he read, I learned more about Derrick. One poem was dedicated to his father, called “Legacy.” Another was about his mother, called “Mother to Son.” And one poem, which was hard for him to read, was called “Forgiveness.” It was about him belittling a schoolmate. He told the class he’s still looking for that girl. He wants to ask forgiveness. With each new visit I hope to discover a little bit more about Derrick Weston Brown. I now know he’s not shy, he just likes to let his poems talk for him. As I sat down at the November 12th Derrick Weston Brown presentation at Oakland Mills High School, I truly had no idea what to expect. Shortly after my arrival students started piling in, filling row after row. When Derrick started his presentation, he did not start with a poem or an introduction, rather he started it with a few questions to the class. “Who likes poetry?” he asked first. The audience seemed indifferent. “Who could care less about poetry?” A few went up. “Who hates poetry?” A few more hands hit the air. “Who likes to write poetry?” A couple of hands rose tentatively. The questions were a great way to grab the attention of the students, who perhaps did not care about this random writer they had never heard of standing in front of the room. As the event went on, Derrick read his work, he asked and answered questions and it seemed like he, as well as the students, were having a good time. However, it was not the poetry alone that made the program so enjoyable. Derrick’s interactions with the students seemed so natural and so unplanned that it allowed the flow of the presentation to move artlessly. 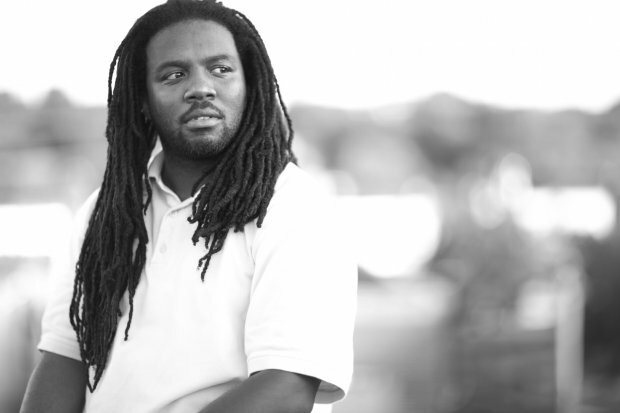 HoCoPoLitSo is proud to announce that poet Derrick Weston Brown will become its 21st Writer-in-Residence where he will work with students in each of the Howard County Public School System’s high schools over the course of the year. 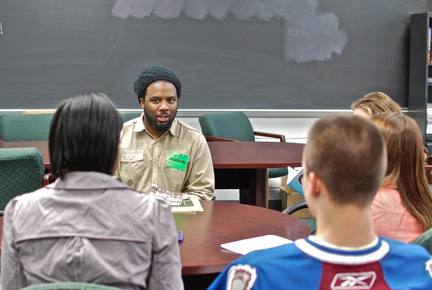 The program focuses on exposing students to fine arts via poetry and literature. Brown is a published author with his first book of poetry, titled Wisdom Teeth, released April 2011. He is a staff member with Teaching for Change, an organization that provides teachers and parents with the tools to transform schools into centers of justice where students learn to read, write and change the world. Brown holds an MFA in creative writing, from American University. He graduated from the Cave Canem Summer workshop for black poets and the VONA summer workshop. His work has appeared in the Warpland, Mythium, Ginsoko, DrumVoices, The Columbia Poetry Review literary journals, and the online journals Beltway Poetry Quarterly, Howard University’s Amistad, LocusPoint, and MiPOesias. HoCoPoLitSo’s Writer-In-Residence program is part of a long-term partnership with the county’s public school system to enlighten students by exposing them to literary arts. Writers such as Sandra Beasley, Marion Winik, and Dr. Michael S. Glaser have visited each of the county’s high schools and the Homewood Center offering workshops and insights to and for student readers and writers. For thirty-one (31) years the HOward COunty POetry and LITerature SOciety (HoCoPoLitSo) has awarded book prizes to the winners of its All County Writing Competition, and honored students nominated by their teachers for Promise and Achievement in Language Arts. To foster lifelong reading habits and a love of literature, HoCoPoLitSo presents book awards with personalized bookplates. The tradition continued this year as HoCoPoLitSo board members made presentations at all Howard County public high school honors assemblies for seniors. The ten creative writing winners were AMY FARB (Centennial), WEI YUE LU (Centennial), and MARY SIMPSON (Centennial) in the personal essay category; CAROLINE CROWDER (Mt. Hebron), JACLYN ANDREWS (Howard), PATRICIA CARMONA (Mt. Hebron) and BRIDGET MACKRELL (Mt. Hebron) in the poetry category; and in the short story category, REBECCA CURRAN (Mt. Hebron), JULIA DUNN (Howard), and SYDNEY CHANMUGAN (Mt. Hebron). This year’s judges were Patricia VanAmburg, writer and professor of literature, Joyce Braga, young adult author, and Mark Braga, technical writer and engineer. In addition, twenty-six students were chosen by their English Departments to receive HoCoPoLitSo’s Promise and Achievement Award in Language Arts. The honorees were: LAUREN BERMAN, JACOB SMITH (Atholton) SARAH CALVERT, WEI YUE LU (Centennial), EMILY SCHWEICH, ANNELIESE FAUSTINO (Glenelg), SIERRA SIMPSON, JASON SCHOENFELD (Hammond), SIERRA PETERS, RACHEL McMURRER (Homewood Center), LINDSEY SABLOWSKI, MADELINE STUDT (Howard), JESSICA GUERRERO, JUSTIN BIEGEL (Long Reach), COURTNET O’HARO, JONATHAN MATHEWS (Marriotts Ridge), NICHOLAS CORTINA, HANNAH VAUGHAN (Mt. Hebron), LYNN COURNOYER, ROSS RHEINGANS-YOO (Oakland Mills), HALEY SWEETON, ALEXANDER SHAW (Reservoir), IFEOLUWA OLUJOBI, CHRISTINA ROMANO (River Hill), EMMA BOONE, JOE WAN (Wilde Lake). Thirty-five students in all received books by such outstanding poets and writers as: Margaret Atwood, Sandra Beasley, Hugo Hamilton, Donald Hall, Shelia Kohler, Laura Lippman, Frank McCourt, Grace Paley, Francine Prose, Reynolds Price, and Colm Tóibín. HoCoPoLitSo has been dedicated to enlarging the audience for contemporary poetry and literature through public readings, special events, writer-in-residence visits, and The Writing Life, a cable television series produced at Howard Community College, since 1974. HoCoPoLitSo is supported by the Howard County Arts Council through a grant from Howard County government, the Maryland State Arts Council through the State of Maryland and the Department of Business and Economic Development, the National Endowment for the Arts, the Columbia Film Society, the Columbia Foundation, the Jim & Patty Rouse Charitable Foundation, the Rouse Company Foundation, and Friends of HoCoPoLitSo. 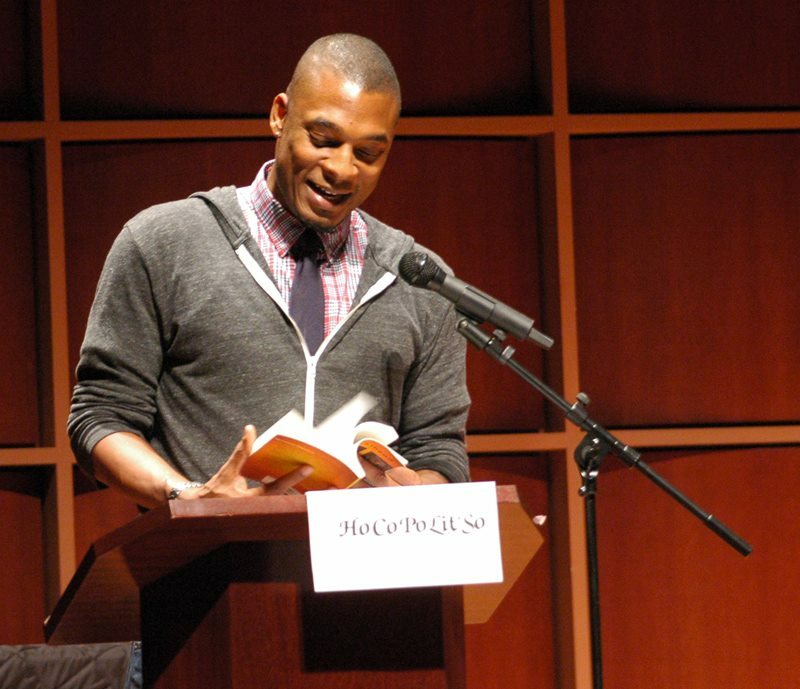 Congratulations are in order for Terrance Hayes who was recently chosen for President Barack Obama’s new National Student Poets Program (NSPP) panel. “Hayes is one of four literary leaders who will judge students who received a National Scholastic Art & Writing Award for poetry. Five high school students will be selected to serve for a year as national poetry ambassadors.” He is a wonderful choice for the task. In October of last year, Terrance Hayes joined Tara Betts on stage at Howard Community College’s Monteabarro Hall to launch HoCoPoLitSo’s 2011-12 season with our inaugural Lucille Clifton Poetry Series reading. In 2010, Hayes won the National Book Award for his 4th poetry collection Lighthead. He is currently on the faculty at Carnegie Mellon University in Pittsburgh. Year after year, a highlight of our literary season is being able to introduce the works of Shakespeare to students. This morning (December 19th), HoCoPoLitSo brings Bill’s Buddies, a troupe of Shakespearean actors from the Folger Shakespeare Library in Washington, DC, to yet another audience of Howard County middle school students with a performance hosted at Marriotts Ridge High School. Shakespeare’s plays still contain timeless situations you might see played out in the halls of your school everyday: miscommunicating your feelings, fights between friends, and problems within families, just to name a few. Watch Bill’s Buddies bring Shakespeare’s words to life as they perform at your school, and decide for yourself if Shakespeare’s language is worth a chance! The engaging performances open the eyes and ears of students to the relevance of the work now centuries on, letting it speak to their generation. There’s magic in the web of it.